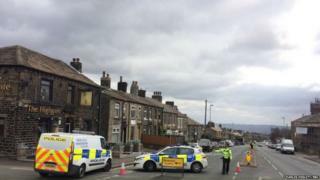 A man has been arrested on suspicion of murder following a fatal stabbing close to a main road in West Yorkshire. Police were called to New Hey Road, Huddersfield, at about 02:20 GMT on Tuesday after reports that a 42-year-old man had received stab wounds. A 39-year-old man from the Quarmby area of Huddersfield has been held and will be questioned about the stabbing. On Tuesday West Yorkshire Police said a murder inquiry was under way, and a large cordon had been placed in the area near The Highgate pub.